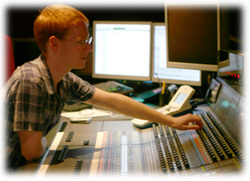 I am a London (UK) based freelance film re-recording mixer with more than ten years’ experience in the industry. My strong musical background and creative flair, founded upon the rigorous technical training of the prestigious Tonmeister course, will bring a dynamic and unique final touch to your film sound track. Follow the menus above to read how I can guide you and your creative team in taking your film project from the first stages of sound concepts, comfortably through to the final furlong of the film-making process: the final mix.